At Master Muffler, we might be famous for our muffler repair and installations, but we also offer comprehensive services for your car, including the air conditioning system. Here in Kearns, temperatures venture up to the 100’s during the summer. In order to be comfortable in your car, it’s essential that the air conditioning is doing its job. 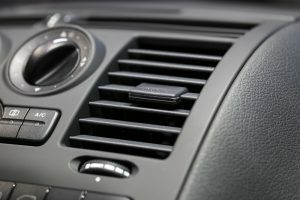 Your car’s air conditioning system is rather unique from the rest of your car’s engine and associated parts. Air conditioning works using principles of thermodynamics, cycling refrigerant through high-pressure and low-pressure stages of a closed system. As refrigerant transitions from the high-pressure zone (wherein it’s compressed to liquid form) to the low-pressure zone, it evaporates and expands, quickly absorbing heat from all the surrounding air. This suddenly-cooled air is blown through the vents of your car, keeping you completely comfortable and cool. Compressor: The compressor is the only part of the air conditioning that’s connected to the engine. Powered by the serpentine belt, it compresses freon in its gas form, creating the pressure that starts the cycle. Condenser: The condenser further pressurizes the refrigerant with a cooling fan which helps the refrigerant reach liquid form. Receiver-Drier: In liquid form, the freon is put into the receiver-drier, which removes any foreign elements, from water to little bits of dust. Thermal expansion valve/orifice tube: Depending on your system, your car might use a thermal expansion valve or an orifice tube. Both of these pieces monitor the pressure in the system, allowing the compressed liquid to expand. Evaporator: In the evaporator, the liquid fully expands into vapour form, quickly cooling the surrounding air. Cooled air on the opposite side of the evaporator is blown into the cabin with an oscillating fan. From the evaporator, the freon re-enters the compressor and is cycled through again. Hoses and tubes: Connective hoses and tubes are essential for the proper function of your air conditioner, since it’s a closed system. Airtight seals are needed in order to keep the pressure. Often, problems with your air conditioning system can be traced to a leak somewhere. Refrigerant: Modern air conditioners use a form of freon called R-134A as a refrigerant. This is a safer element, which is less harmful to the environment than the R-12 used 30 or more years ago. Refrigerant is efficiently cycled through the system, and so should need to be changed or refilled very seldom. So, if it’s getting a little too toasty in your car, bring it in for a checkup. We can determine whether your system needs little bit of work in order to keep your car cool and comfortable.